A week ago, I visited my oldest daughter who is working in Washington, D.C. We had a great time, but because she had to work two of the days I was there, I had a chance to visit some gardens in the capital city on my own. I lived in D.C. for three years in the 1980s and have visited many times since then, but there are always new things to see. These are gardens that many tourists miss, but are well-worth a visit. The mansion is a time-warp with some rooms reminding you of 1930s glamor and others of 1960s modernity. There’s a great collection of Russian art and icons (one of Marjorie’s husbands was ambassador to Russia) as well as Faberge eggs to admire and 18th Century French paintings on the walls. It is indeed fabulous. But it was the gardens that brought me there, and they did not disappoint. The Friendship Garden at Hillwood in Washington, D.C.
Post frequently entertained in her garden, which covers about 20 acres, overlooking nearby Rock Creek Park. 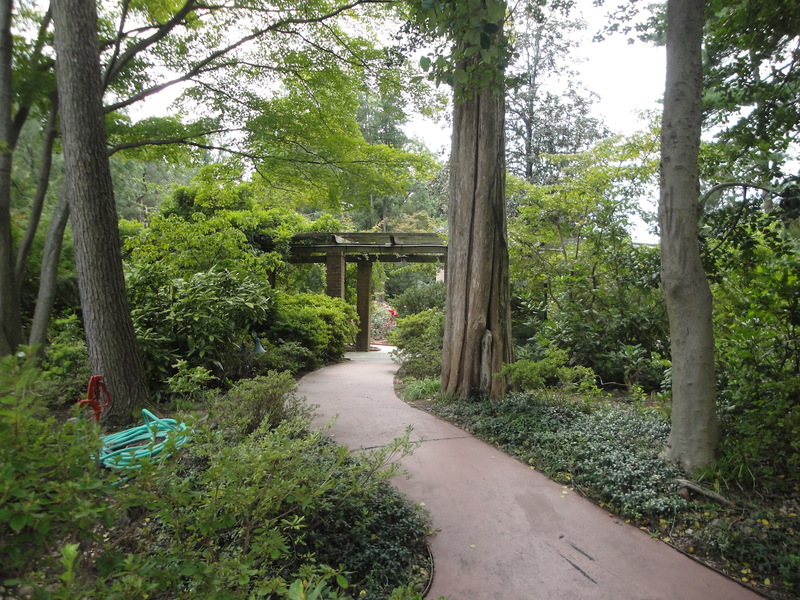 The area is heavily wooded, including several large crepe myrtle trees, and divided into nine garden rooms. 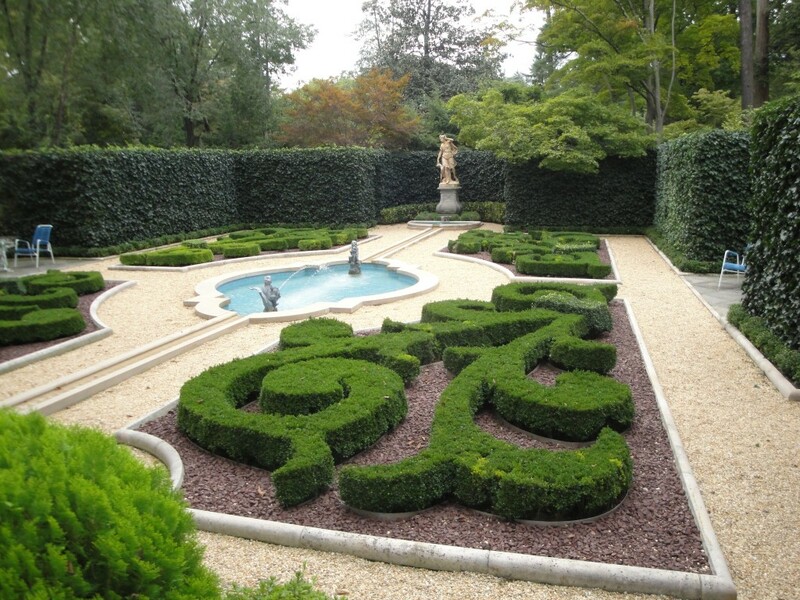 I loved the French Parterre garden with its boxwood hedges and sculpture and the Friendship Walk, a garden donated by Post’s friends, which includes the tall column that contains her ashes. 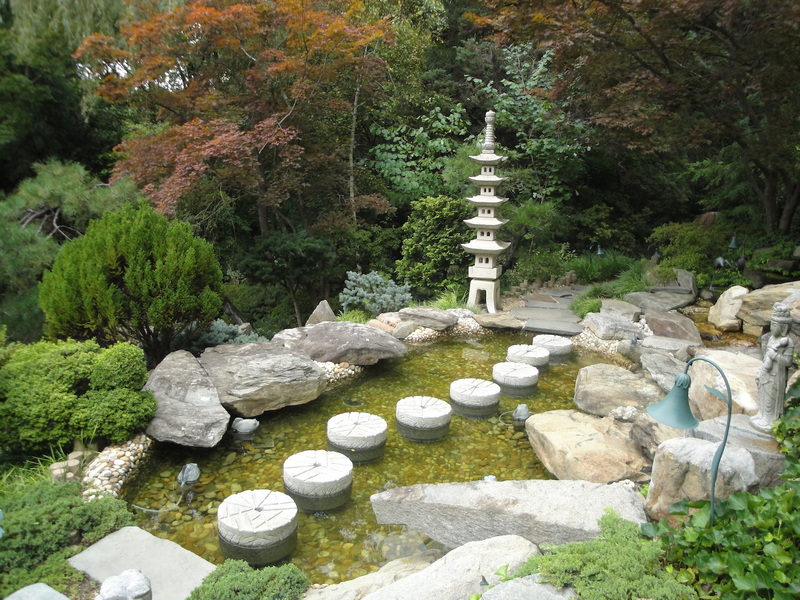 The Japanese Garden was a special treat with its laughing Buddha statue, colorful maples, and the layered use of rocks, plants and water. A lovely water feature in the Japanese garden. If you are going to be in D.C. before the end of 2011, stop by the exhibit of wedding dresses from the Post family, which is in the Adirondack Building on the estate. (Remember: Marjorie had four weddings and three daughters!) The dresses span much of 20th Century fashion and are each, well, fabulous. Admission is $15 for adults and includes a well-done, self-guided audio tour. I especially liked the recollections for gardeners at the estate, who talked about preparations for Post’s annual garden party for 500. Visiting the Smithsonian Mall is a must-do for almost any visitor to Washington. If you don’t want to look at another stuffed mastodon, old airplane or master work of art, consider a stroll through one of the many gardens near the mall. I hit two on my most recent trip. 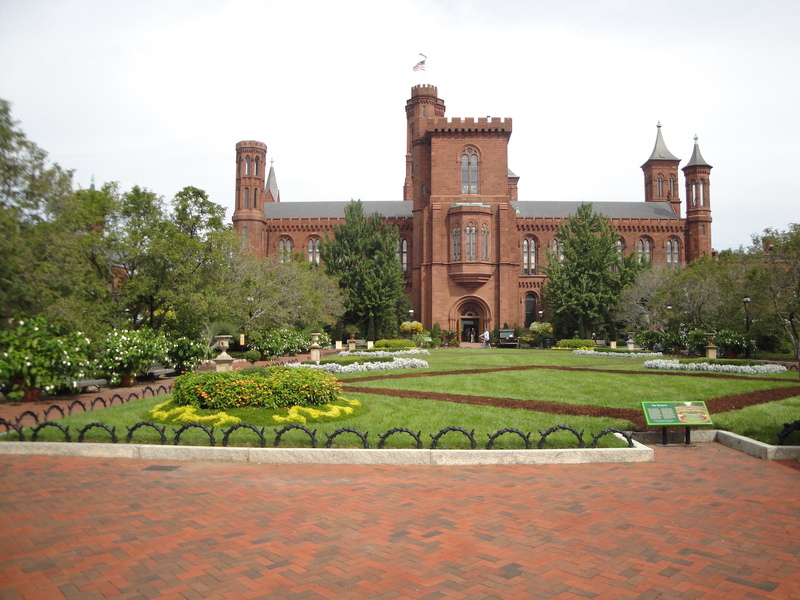 The Enid Haupt garden is a formal space near the “castle” museum of the Smithsonian. Behind the Smithsonian Castle is the Enid A. Haupt Garden. This formal space of clipped boxwood, annuals and roses is a quiet respite from a day of touring. Interestingly, it’s actually a roof-top garden, sitting above the National Museum of African Art and two other galleries. The garden features several dhobi trees, a shrub native to India that’s attractive to bees and butterflies. Walking across the mall toward the west building of the National Art Gallery (the basement cafeteria there is my favorite place for lunch on the mall), I walked through the Butterfly Habitat Garden, too. Despite being near a busy road, the garden’s plantings of lantana, sunflowers, butterfly bush, and other nectar plants attract butterflies. The garden demonstrates how much home gardeners can do to provide for beneficial insects. Like every other Smithsonian museum, these gardens are free. 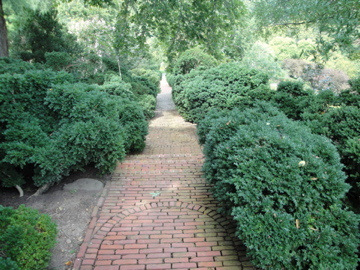 It was a longish (about 1.5 miles) but lovely walk from the Dupont Circle Metro stop to Dumbarton Oaks, a 37-acre estate above the wealthy enclave of Georgetown. I really liked these bison posted at either end of the Dumbarton Bridge, and they seemed to indicate you were entering a different part of town. 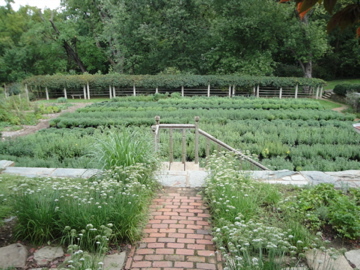 Dumbarton Oaks is located in one of the higher spots in Washington. Built in the early 1800s, for most of the 20th Century, it was owned by Robert and Mildred Bliss. In 1921, Mrs. Bliss hired young landscape architect Beatrix Farrand to help design a garden for the estate. Thus began an incredible gardening partnership that lasted the next 20 years. Farrand believed in Charles Sargent’s admonition to “make the plan fit the ground and not twist the ground to fit the plan.” She used the hills and valleys of the land to create a series of terraces and gardens, sculpted to the shape of the property. Stone walkways and steps seem to rise naturally from the hills. Bliss and Farrand took great care to create vistas, that lead the eye through the gardens, such as this view that extends from a terrace near the house to the Ellipse. The walkway is edged in boxwood. 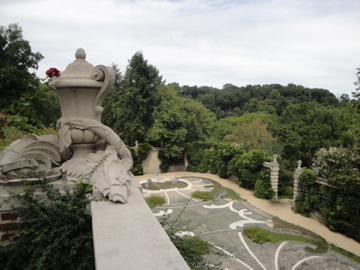 The vase on a terrace railing overlooks a pebble garden and the deeply wooded estate. Art is used selectively throughout the garden, which has a unity of spirit that comes from the close association of the two women who designed it. Filled with pools, orchards and extensive walkways, the garden is park-like and awe-inspiring. At one point, needing to rest my feet from a big day of walking, I sat on a bench under a crabapple tree and just watched the other visitors to the garden moving around. The spot, one of dozens around the estate, offered seclusion and privacy, yet a sense of being able to observe and connect with the world. The estate includes specialty gardens for roses (70 varieties, many of them richly fragrant), herbs, cut flowers, lilacs, and forsythia. The estate is only open from 2 to 6 p.m., March 15 through Nov. 1 The fee is $8. 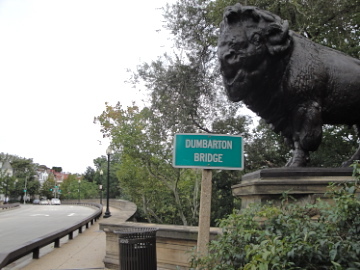 For a lovely walk through the top of Georgetown, walk west on Q Street from the Dupont Circle Metro stop, crossing the Dumbarton Bridge. Turn right at 28th Street NW, to pass by Oak Hill Cemetery, one of D.C.’s oldest and most interesting cemeteries. You’ll turn left at R Street and walk three blocks to enter the garden. How I enjoyed these tours, very informational and such eye candy, too! Love the Japanese gardens and all the beautiful landscaping. Thanks, Karen! These are great gardens to visit. I bet spring time would be even more pretty.